The horoscope above belongs to Jean Baptiste-Morin, who was born at or somewhere near Villefranche-sur-Saône, France (45°N59'N/ 4°E43'). 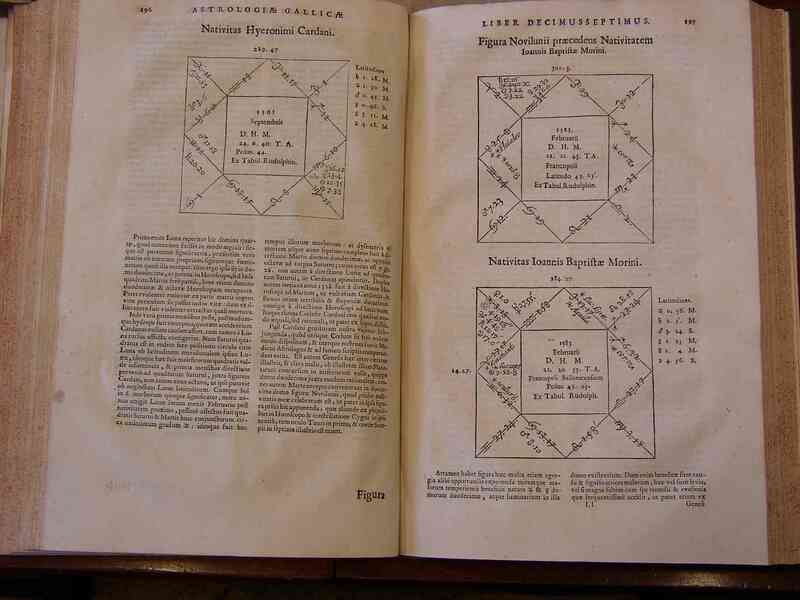 The chart is published in the 17th book of his Astrologia Gallica, and the Latin edition of the page that shows the chart can be viewed here. The information in the centre of the chart shows that positions were calculated by reference to Kepler's Rudolphine Tables, using a latitude of 45°N25, and a time of 20 hours, 33 minutes after noon on 22 February, 1583. As William Lilly explains in his Christian Astrology (p.30), it was the convention of astrologers to "ever begin our day at noon, and so reckon 24 hours from the noon of one day to the noon of the next". To establish the modern local mean time (LMT) equivalent of this chart, we might assume that we simply add 20 hours and 33 minutes to 12:00pm of 22 February, to obtain a birth time of 8:33am LMT, 23 February, 1583 - the time usually reported as that Morin gives for his own birth, because of the information in this chart. The problem is that calculating the chart for 8:33am LMT does not come close to replicating this chart, and places the ascendant at 20°59' Aries, rather than 27°17' Aries as Morin has it. To be clear, Morin did not report that he was born at 8:33am on 23rd February, but 20 hours, 33 minutes after noon of 22nd February. To derive the equivalent in local mean time we have to consider that noon - astronomically defined by the Sun's transit of the upper meridian (MC) - occurred at Villefrance on February 22nd 1583 at 12:14pm LMT. It is to this time we add the 20 hours and 33 minutes, resulting in 8:47am LMT, 23 February 1583. Using this time allows an almost perfect recreation of Morin's published horoscope by modern computer, as shown in the Janus chart below. This shows the Regiomontanus houses that Morin shows, and is set for 8:47:33am LMT, 23 February 1583 GC, using the latitude Morin reports (45°25') and a longitude of 4°E43' (it makes virtually no difference to the chart to use a rounded up longitude of 5°E or a rounded down longitude of 4°E). The modern-format chart includes the positions of the outer planets that Morin was unaware of, for the benefit of those who are curious about how they impact on this chart. Unfortunately it does not show the positions of the fixed stars he noted - anyone trying to understand what Morin would have thought of his chart should take good notice of these, as he considered them important elements of his nativity. Raizin reports that Morin died of a fever "on the 6th of November, 1656, at 2 in the morning" having shown himself to be aware of his impending death the month before, whilst in good health. Unfortunately the historical source of this report is not given in Raitzin's article, which is available online at https://www.forumonastrology.com/foa/morin-life-1.html. It is said that Morin, then aged 73, smiled at his doctor's attempts to save him, because he had already seen the certainty of his death in his stars. For example, Cardinal Richelieu's horoscope had Jupiter in Gemini in the 8th house with the fixed star oculus Taurus, which showed his death from a terrible disease. Also, … the horoscope of Monsieur des Hayes had Jupiter in Gemini in the 8th house with oculus Taurus and Mars ruler of the Ascendant, as well as the Moon in the 7th with the Pleides and the fixed star caput Medusae, and square to the Sun ruler of the MC, and he too was decapitated by order of the king. In my own horoscope I have Jupiter - ruler of the 8th - and Saturn both in the 12th and have suffered from many serious diseases but luckily I recovered because of good medical treatment; I also have been in danger of a violent death several times and was once very gravely wounded. Astrologia Gallica, bk. 21, trans. by R.S. Baldwin (AFA, 2008); pp.60-61. Being aware of the notable transiting conjunction of his 8th-ruler Jupiter and oculus Taurus, Morin would have felt particular concern for the period around early November, when his 6th-ruler Mercury also transited the conjunction of the martial fixed star Cor Scorpio (Antares: then at 4°58 Sagittarius), whilst entering his 8th house of death (in opposition to the Jupiter-Aldebaran conjunction on the 2nd house cusp). Antares is another of the stars that Morin considered significant enough to draw into his horoscope, its effect on health being to "many times produce a burning fever" (Lilly, CA, p.689). With a backdrop of the two malefics transiting his 6th house, Morin's 6th and 8th house rulers align in opposition whilst both are joined to fever-inducing stars. What really personalises the configuration is that the opposition falls upon the square of Morin's natal Sun-Jupiter conjunction in the 12h house, and his natal 6th house cusp. From these facts alone Morin would assume that any illness experienced at this time would prove fatal. The bi-wheel below shows the transits in play at the reported time of Morin's death. The Moon, radically placed in the 12th house and ruling the 4th house of endings, had by transit entered the early degrees of Cancer, where it applied to his natal Sun-Jupiter conjunction to bring their pivotal placement in the fatal configuration sharply into focus.